There hasn't been a book published like High in the Empty Blue for almost thirty years, the kind of comprehensive squadron history that relates the day to day activities of a unit in considerable detail. This book tells the story of 56 Squadron, RFC from creation to its disbanding in 1920. In just three and one half years 56 Squadron became the most successful fighter squadron in the RFC/RAF. Alex Revell tells a well-researched historical saga of one of the most famous squadrons of the First World War in a manner that keeps the reader glued to its four hundred plus pages. Whether the reader is interested in individual pilots, the evolution of aerial warfare or just "rippin' yarns of air combat," this book appeals at many levels. Technically, this book by Flying Machines Press is well produced. Four hundred and fifty hardbound pages plus four hundred and thirty photos and eight pages of color photos make this book worth the hefty $53 price. It is a welcome sign to the aviation enthusiast that Flying Machines Press is producing such a superb book that does not cater to the masses. Perhaps this means new opportunities for the readers and writers of our niche in the publishing world. Certainly the traditional publishing world has shown little interest in our genre. When the have, the have often butchered the writer's manuscript to fit a particular format or number of pages, or forced changes to make the work appeal to a broader audience. Let's hope Flying Machines Press holds up its high standards. High in the Empty Blue tells many fascinating stories of 56 Squadron. Perhaps a brief review of the unit is in order: 56 Squadron was the first squadron equipped with the S.E.5 aircraft. It also was home to those who were arguably the best British aviators. The initial cadre was Englishmen of high social background, pilots such as Albert Ball, Arthur Rhys-Davids and Cecil Lewis. But by war's end, half of the squadron was composed of Canadians, Americans, and middle-class British such as James McCudden. Initially the squadron was equipped with the S.E.5, but was replaced with the S.E.5a. One of the most interest aspects of the book is the rich detail which allows the reader to see how the aircraft's technical problems and design superiorities influenced the squadron. 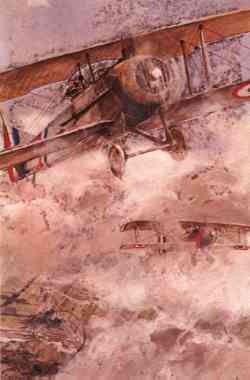 From the time the squadron arrived in France it was equipped with some of the best aircraft available, and the narratives of the pilots show the effect on morale and success by having aircraft which essentially allowed 56 Squadron to engage, or not engage, as they wished. The air battles against the Albatros and Pfalz scout of 1917 and early 1918 were almost exclusively on their terms and allowed the squadron to have a constant supply of well-trained pilots and flight commanders. It wasn't until the Fokker D.VII was available in mid-1918 that the squadron had cause to worry. By that time, the numerical superiority of the Allies forced the Germans to fight outnumbered 5 or 6 to 1 during the last six months of the war, when the slight inferiority of the S.E.5 was not of great importance. Of great interest to me was the story of the squadron's legendary fight against Werner Voss in his Fokker Triplane. The author offered a fairly uncommon thesis that Voss could have ended the battle against seven of 56 Squadron's best pilots anytime he wanted. The narratives of the participants all agreed that Voss was the best pilot they had ever flown against and the superior climbing ability of the Triplane would have allowed Voss to disengage the battle if so inclined. Voss was such a spirited warrior that he pressed the battle, and by some of the narratives almost won. Voss drove down two of the S.E.5a's and damaged all of the others before being brought down by Rhys-Davids. It was the agreement of all of the flight members that they wished they could have brought Voss down alive. In comparison to the battle with Voss in the autumn of 1917 were the battles in the autumn of 1918. By September of 1918, 56 Squadron had suffered taxing losses and the war had removed the concept of chivalry from the thoughts of the squadron's pilots. Revell does an outstanding job of illustrating this by including two particular pilot narratives both from a Capt. Holleran, who was a flight commander. His first entry is about his concern for a member of his flight who was shot down earlier that day. He was worried that the pilot might have been wounded because later that day he led his flight on a strafing run on a "boche" hospital and he was worried his man could have been in there. The second incident occurred the next day when Holleran went after a balloon. He expended all his ammo but the balloon wouldn't burn and he was chased off by the AA. Holleran went back to base, loaded his bomb racks up with 25 pound bombs and returned to bomb and strafe the AA batteries, but again he was driven off by the AA gunners, although he had done them considerable harm. This was not enough for Holleran, so he went back home, loaded up with more bombs and attacked a field hospital near the AA batteries just to finish off any he missed on the first two visits. For the reader, it is amazing watching this transformation in attitudes as the war progresses. I could go on with numerous stories such as these, but why don't you experience flying and fighting with the 56 Squadron for yourself? Alex Revell's book is the ideal passport back 75 years for you armchair historians, with extensive month-by-month narratives and maps of the front. The photos in the book and the colour plates provided the modeler with extensive documentation of squadron and pilot marking of the earliest S.E.5's to the late war S.E.5as. Lastly, the FITS player will feel a greater appreciation for the tactics and realism of the game after reading this book. I know I did.